We're off on an amazing family trip to visit friends in Hong Kong. Then we will venture to China. 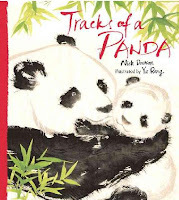 So I would like to share a wonderful picture book about a mother panda and her baby. A mother panda brings a baby into the world, and teaches it how to survive in their mountain habitat. This picture book blends fiction and nonfiction in a beautiful way. You relate to the mother's search for a safe place for her baby, but you learn so much about the panda's habitat and life along the way. Each page has the story of the mother and her baby, and it has separate sidebars with information about pandas. The baby panda is born, tiny and pink, in the summer: "Small as a pinecone, pink as a blob of wriggling sunset." It almost reads like poetry. The mother protects it and feeds when she can. As winter comes, mother and baby leave the safety of her den in search of more food in the mountains. Along the way, the mother keeps her cub safe from a wild dog, teaches him to swim, and shows him how to find the right bamboo. This is not a book for school reports, but is a perfect nonfiction picture book. It teaches the reader more about pandas, but leaves them yearning to keep learning about this special animal. The illustrations are in a traditional Chinese brush and watercolor style. They are simple but moving and give a feeling of the pandas as a real treasure in China. Find this book at the Berkeley Public Library or the Oakland Public Library. I just noticed that at Amazon, it comes with a CD or DVD - I have not seen this, but am intrigued. If you have a chance to see this accompanying CD, please let me know what it's like. Girls in 3rd and 4th grade often go through friendship troubles. Their friends are so important to them, but they can easily hurt each other's feelings without realizing. Moon Runner is a wonderful book all about how girls negotiate their friendships, while still being true to themselves. MA: Candlewick Press, 2005. 97 pages. Mina loves her group of friends. Every day they trade their Friendship Ball, adding bits of multicolored yarn to the growing ball. They are each different: Ruth is the athlete, Sammy loves to collect bugs, Alana is the best reader, and Mina is the New Friend. But one day, Coach Lombard asks all the 4th and 5th graders to try out for track: the high jump, the long jump, the fifty meter dash, the team relays. At first, Mina feels like a tortoise lumbering along, but soon she imagine "a roadrunner skipping along on tall, skinny legs." She starts enjoying running, and begins sailing along. "By the third lap, she remembered her favorite dream of flying off a snowy cliff and over a landscape speckled with pools of turquoise water." Mina actually is a great runner - and she almost beats Ruth. When she ties Ruth in the 50-meter sprint, Mina worries that their friendship will suffer. Should she lose on purpose, if that will save their friendship? This is a short but heart-felt book, perfect for girls this age dealing with the importance of friendship issues. Mina is a sympathetic and believable character, and middle grade readers (in 3rd through 5th grades) will recognize her struggles as ones they see at school all the time. Moon Runner is available at the Berkeley Public Library and the Oakland Public Library. You can find it in paperback at Amazon, as well. This review was written by Mary Ann Scheuer for Great Kid Books. Copyright 2009. Sometimes a book really leaves me at a loss of words. This book, Bird, is hard to capture - it is a short, complex story, but one that is moving, beautiful and sensitive. It tells a story of a young boy whose family is torn apart by drugs; now this young boy is trying to make sense of it all. The author and illustrator together tell this story in a thoughtful, tender way. NY: Lee and Low Books, 2008. Mehkai's family has always called him Bird. As a baby, he used to lay in his crib with his mouth open, chirping just like a little bird waiting to be fed. Now, as a boy, he loves to watch and draw birds. His big brother, Marcus, used to teach him how to draw. But then Marcus got sick and his family couldn't help him. Through implication, his brother had become addicted to drugs, but it's never said outright. This is a sensitive, realistic urban story that resonates with the life of many kids today. Bird deals with his grief through connecting with Uncle Son, his grandfather's best friend, and through drawing the world around him. Art is an escape for Bird. It opens possibilities for him, and allows him a safe way to connect to his brother. In many ways, the artwork in this picture book open possibilities for us, the reader, to connect to Bird's world - both the urban setting, and in his imagination. The illustrations never dominate the story, but they truly illuminate it - drawing the reader into the emotions and the texture of this boy's life. The video book trailer gives you a great sense of this story - check it out and get this book. It's beautiful, emotionally and visually. Bird has won many awards over the past few months. 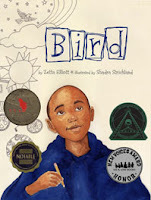 Bird is available at the Oakland Public Library and the Berkeley Public Library. You can also buy it at your local bookstore! I have to send a huge thank you to Doret at the HappyNappyBookseller for my beautiful, signed copy of this book. Please check out her blog - she has great reviews of all sorts of books for kids. Thank you, Doret! GottaBook: Announcing 30 Poets/30 Days! Check out this amazing resource for new, unpublished poems by amazing authors for kids. Each day in April, a new poem will be unveiled! Kids love gross, disgusting things. How often do they looked at those 28 foot long fingernails in the Guinness Book of World Records? Gross! But, here’s a book that will provide solid scientific information as well as plenty of facts to make your skin crawl. What’s eating you? Parasites – the inside story. MA: Candlewick Press, 2007. 61 p.
Clearly based in scientific facts and lots of good humor, Nicola Davies' What's Eating You? will provide hours of fun for young readers curious about the secret lives of parasites. Slimy frogs, hairy dogs, tough sharks, even people have parasites living on their skin and inside their bodies. Davies uses a conversational style, paired with Layton’s funny, cartoon-like drawings, to introduce the reader to real scientific terms and ideas. Parasites’ adaptability to their environment is crucial for their survival. Many have creative (and disgusting) ways to get inside their host's body. "Hookworm eggs are squeezed out with their host's poop, but because humans don't eat their own poop (some animals do - rabbits, for instance! ), hookworms need some other route into a new body. So ... the eggs hatch into baby hookworms tiny enough to wiggle between human skin cells, and in places where poop can be stepped into by people, they get into the blood and then back to the gut - where they grow up and start feeding." Did you know that a tapeworm inside a human intestine can grow to 60 feet long?! “They don’t need a mouth or a gut of their own, because they just float around in your digested food and soak it up through their skin.” Eeww!! But what 10 year old won’t love telling this at the dinner table? Davies writes in a funny and engaging way; she shares information in bite-sized pieces, perfect for reluctant readers who need to be drawn into a book. The writing style reminded me somewhat of the Diary of a Wimpy Kid style, in its informal approach – but this has much more content. Have fun – but be prepared for some disgusting dinner conversations! Find it at the Oakland Public Library or the Berkeley Public Library. For more Nonfiction-Monday delights, head over to MotherReader. Lia and Cassie are best friends. But by senior year, they have drifted apart and barely speak. One night, Cassie tries calling Lia thirty-three times on her cell, and Lia ignores it. The next day, Cassie is found dead, alone in a motel room. audiobook published by Brilliance Audio. Lia is 18, and has anorexia - an eating disorder where she starves herself in a quest to lose weight, to be the skinniest girl at her school. She's been committed to an inpatient clinic twice already. And now, Cassie is dead. Lia starts spinning out of control, being sucked down the vortex of her paranoia, her dreams, her anorexia. It's an agonizing journey of incredible pain as Lia struggles on the border between life and death. Wintergirls is told through the first person perspective, in an almost poetic stream of conscious voice. This narrative acutely shows what Lia goes through, how she battles for control, how her deep depression distorts her logic and her brain chemistry. Please be aware. It details her anorexia, her friend Cassie's bulimia, her cutting herself, and Lia’s attempted suicide. I think this is an important book for adolescent girls - it validates what too many are struggling with or see their friends struggling with. But I do worry that it places ideas in girls' heads, shows them the way. Perhaps some will say that there are so many other ways girls discover this awful route - that this book won't be what's introducing them to these horrors. But you need to be aware of this before recommending it – it has to be for the right kid at the right time. Find Wintergirls at your local independent bookstore. Also check out the audio version, published by Brilliance Audio. Kids who are new to reading chapter books love funny stories that they can relate to. With a sheer love of life and the courage to take risks, Ruby Lu brings the reader right into the joys and fears of being a kid, especially growing up in a Chinese-American family. by Lenore Look, illustrated by Anne Wilsdorf. Atheneum Books for Young Readers, c2004. Ruby Lu is a happy kid. She likes her house. She likes her street and neighbors. Now that she is almost eight, she's allowed to walk to school by herself, and that is great. Ruby loves her life – she has a great, positive outlook. But there are days when it's very hard being Ruby. Like the day when her neighbor's baby brother starts talking and Ruby’s baby brother Oscar won’t say anything. Or the day when her parents want her to go to Chinese school on Saturdays so that she could talk with her grandparents. “But Ruby understood her grandparents just fine. They loved her and she loved them. They brought her treats and she ate them. They took walks in the park and Ruby led the way.” Ruby takes all sorts of paths dealing with the frustrating things in her life. Just like the kids I know, she changes her mind from hating something to absolutely loving it as quick as can be. Lenore Look focuses on home, family and her Chinese-American culture in a way that shares her unique viewpoint, making it both universal and personal at the same time. Ruby’s creativity and voice will engage readers from any background, bringing in outsiders and welcoming Chinese-Americans. She will have readers laughing at Ruby's quirks, and nodding when they see her change her mind about what she loves and hates. Young readers will also appreciate the quick pace of the novel and the funny, frequent illustrations. This is a great book for 2nd and 3rd graders as they become more comfortable with chapter books. You can find it at the Oakland Public Library and the Berkeley Public Library. If you like Ruby Lu, check out the second in the series: Ruby Lu, Empress of Everything. This review was written by Mary Ann Scheuer, for Great Kid Books. Copyright 2009. We all know kids who live with divorced parents, sharing time in each parent’s separate home. Kids do it; parents do it. They adapt. But picture books don’t often show this part of everyday life. Fred Stays with Me! 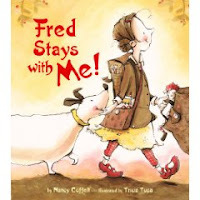 is a simple but powerful picture book about a young girl who travels between her mom's home and her dad's home. She spends nights at her mom's and her dad's, but Fred her dog stays with her, traveling to both homes. I love how this picture book shows the little girl's family life as just accepted. The word “divorced” is never discussed. This is her life, and this is how she lives it. She has the same friend, the same school - but one of her rooms has a bunk bed and the other has a regular bed. Fred is her constant friend and companion throughout it all. Fred is my friend. We walk together. We talk together. When I'm happy, Fred is, too. And when I'm sad, Fred is there." So when her parents tell her that Fred can't stay with either of them, she puts her foot down. "Excuse me, Fred doesn't stay with either of you. Fred stays with ME!" All of them find ways to help Fred work out better. He isn’t a perfect dog, but he is the perfect part of their daughter’s life. There are very few books that show young kids dealing with divorce. But what makes this a perfect book is how it capture’s the child’s point of view. It shows what is important to her, how she adapts to the changes in her parents’ lives, and how she finds the stability she needs. Finally, it shows even-handedness in treating both dad and mom without bias toward either parent. Find it at the Berkeley Public Library and the Oakland Public Library. Find it at Amazon. As our nation struggled for its freedom in the Revolutionary War, thousands of African American slaves wondered about theirs. If a nation could be free, what about them? In 1776, thirteen-year-old Isabel fought for her own freedom in the midst of war-torn New York. This gripping historical novel is well worth reading - for its dramatic story, the struggles of a young slave, and its depiction of war-torn New York. Simon & Schuster Books for Young Readers, c2008. Isabel and her sister were promised freedom upon the death of their owner, but no records were found of a will. Through a cruel sequence of events, Isabel and Ruth were sold by her owner's nephew to the Lockton family in New York. The Locktons were Loyalists and cruel slave owners. They cared little of the sisters' relationship, and ended up sending young Ruth far away. Isabel's heart was broken - she lost her freedom, her home, and now her little sister. When a young slave, Curzon, asked her to spy on the Locktons, she did so - thinking that this might be the way she could claim her freedom. But the Revolutionary Army did not protect her, and she ended up being accused of insolence by Madam Lockton. Isabel was cruelly punished with the branding of an I on her face. The audiobook for Chains is amazing. Madisun Leigh, the narrator, brings alive the thoughts and feelings of young Isabel. I think audiobooks work especially well for first-person stories; Chains pulls the reader and listener into Isabel's plight, and shows the mental and physical horrors of slavery. This would definitely be a great choice for family listening - it would provide lots to talk about, and would engage adults and teenagers. One caution: Isabel's branding and Curzon's time in jail are intense - I would not recommend this for children under 10. Chains won this year's Scott O'Dell Award for historical fiction, and was a finalist for the National Book Award. Ms. Anderson also won this year's American Library Association Margaret Edwards Prize, in acknowledgement of her work for young adults. Find it at the Berkeley Public Library and the Oakland Public Library. You can find the audiobook at Amazon or at Audible.com. Kids love to laugh and tell jokes and funny stories. It's a winning combination. So what better way to get them to enjoy reading and writing poetry than to have them laugh?! The author Jack Prelutsky, our nation's first Children's Poet Laureate, has written a funny, helpful guide to writing poetry, perfect for kids ages 7 to 12.
or his underwear, pinned to the wall. or the toilet, sealed tightly with glue. Best of all, though, is that Prelutsky follows his poems with writing tips to prompt kids to start writing their own poetry. For example, he asks kids to write down as much as they can about something they did that made their parents mad at them. "Did you fling spaghetti at the ceiling? Did you draw on the wall with crayons? Did you switch the salt and the sugar? These are all wonderful things to write about. Write about how you did it. You'll have lots of fun writing about your won misbehavior. By the way, I did all those things ... and more." These tips range from encouraging kids to play with rhyming words, to using lists to help brainstorm about memories. Throughout, Prelutsky advises kids to keep a notebook to jot down every idea, give their ideas time to develop, rewrite and have fun. Find it at Amazon (this is the sort of book you'll want to have around for a while!). It isn't available at our local public libraries yet. Do you love poetry? Check out other links on the web to Poetry Friday, hosted by Anastasia Suen at Picture Book of the Day. This review is written by Mary Ann Scheuer for Great Kid Books. Copywright 2009, all rights reserved.